Citation: Prabu,V. Divya,K. (2015). RTCP CRAHN: A Renovated Transport Control Protocol for Cognitive Radio Ad Hoc Networks. 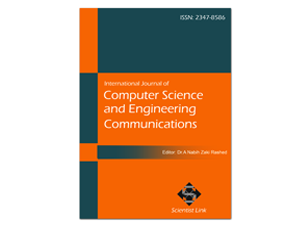 International Journal of Computer Science and Engineering Communications,Vol.3,Issue.2,pp.714-721. Cognitive Radio networks take into consideration about the users to transmit in the licensed spectrum bands, as long as the capability of the licensed User’s band is not degraded. Meanwhile, variation in vacant spectrum with time and frequent spectrum sensing undertaken by the cognitive radio users has a noticeable effect on the upper layer protocol capabilities, such as at the transport layer. During the allotment of unlicensed users there occurs a scheduling problem which increases the delay. This paper investigates the scheduling problem, and proposes RTCP CRAHN, a TCP-friendly protocol. A scheduling algorithm is being proposed to decrease the delay and increase the throughput. An analysis of the expected throughput in TCP CRAHN is provided, and simulation results reveal significant improvements by using our approach. New wireless technologies are rapidly permeating all aspects of commercial and social life, thus ever increasing the demand for higher bandwidth availability under heavy traffic loads. These technologies must co-exist in the same RF spectrum in a non-interfering manner. The prevailing policy for managing this coexistence of multiple wireless technologies in the RF domain is to statically allocate the available spectrum. A static allocation separates different RF services in frequency, for the purpose of alleviating interference and contention, while providing quality of service. All useful spectrums from 3 KHz to 300GHz are already licensed for exclusive use to various entities with only a very small portion of it left for unlicensed use. Because the spectrum is already allocated, new wireless technologies find it increasingly hard to operate in unlicensed bands, where they face significant contention and interference from other services. This situation is typically termed as spectrum scarcity, referring to the unavailability of any useful spectrum bands that can be allocated. However, studies of the spectrum scarcity problem by various regulatory bodies around the globe, including the Federal Communication Commission in the United States of America and Of Com in the United Kingdom have shown that this problem is the artifact of the spectrum management policy. Further, these studies indicate the under utilization of the already allocated spectrum. In fact, according to the FCC, the temporal and geographical variations in the utilization of the assigned spectrum range from 15% to 85% the signal strength distribution over a large portion of the wireless spectrum. Defined radios, also known as Cognitive Radios, named due to their sensing and adaptability capabilities. According to a CR is a radio that can change its transmitter parameters based on interaction with the environment in which it operates. A. Capone, L. Fratta, and F. Martignon (2004), “Bandwidth Estimation Schemes for TCP over Wireless Networks,” IEEE Trans. MobileComputing, vol. 3, no. 2, pp. 129-143. K.Divya, D.Nisha, M.Surya (2014), “Performance Analysis of Transport Control Protocol for Cognitive Radio Ad Hoc Network”, IJARCCE vol. 3, Issue 4, April 2014. K.Divya, M.Surya (2014), “Modified Transport Control Protocol for Cognitive Radio Ad Hoc Network”, IJERT vol. 3, Issue 4, April 2014. ISSN : 2278-0181. Ganesan.G and Li.Y, “Cooperative spectrum sensing in cognitive radio networks,” in Proc. 2005 IEEE DySPAN, pp. 137–1431164, Elsevier. G. Holland and N.H. Vaidya (1999), “Analysis of TCP Performance over Mobile Ad Hoc Networks,” Proc. ACM MobiCom, pp. 219-230. I.F. Akyildiz, W.Y. Lee, and K. Chowdhury (2009), “CRAHNs: Cognitive Radio Ad Hoc Networks,” Ad Hoc Networks J., vol. 7, no. 2, pp. 810-836, Elsevier. J. Liu and S. Singh (2001), “ATCP: TCP for Mobile Ad Hoc Networks,” IEEE J. Selected Areas of Comm., vol. 19, no. 7, pp. 1300-1315. K. Chen, Y. Xue, and K. Nahrstedt (2003), “On Setting TCP’s Congestion Window Limit in Mobile Ad Hoc Networks,” Proc. IEEE Int’l Conf. Comm. (ICC), pp. 1080-1084. K.R. Chowdhury, M. Di Felice, and I.F. Akyildiz (2009), “TP-CRAHN: A Transport Protocol for Cognitive Radio Ad Hoc Networks,” Proc. IEEE INFOCOM, pp. 2482-2491. L. Brakmo and L. Peterson (1995), “TCP Vegas: End to End Congestion Avoidance on a Global Internet,” IEEE J. Selected Areas in Comm. vol. 13, no. 8, pp. 1465-1480. M. Di Felice, K. Chowdhury, W. Kim, A. Kassler, and L. Bononi (2011), “End-to-End Protocols for Cognitive Radio Ad Hoc Networks: An Evaluation Study,” Performance Evaluation, vol. 68, no. 9, pp. 859- 875. M. Di Felice, K.R. Chowdhury, and L. Bononi (2009), “Modeling and Performance Evaluation of Transmission Control Protocol over Cognitive Radio Ad Hoc Networks,” Proc. 12th ACM Int’l Conf. Modeling, Analysis and Simulation of Wireless and Mobile (MSWIM ’09), pp. 4-12. Mishra.S,Sahai.A, and Brodersen.R, “Cooperative sensing among cognitive radios,” in Proc. 2006 IEEE International Conf. Commun., vol. 4, pp. 1658–1663. Mitola.J III and Maguire. G. Jr.,“Cognitive radio: making software radios more personal,” IEEE Personal Commun.,vol. 6, pp. 13–18, 1999. S. Floyd and T. Henderson (1999), The NewReno Modification to TCP’s Fast Recovery Algorithm, IETF RFC 2582. S.M. Kay (1993), Fundamentals of Statistical Signal Processing: Estimation Theory. Prentice - Hall. T. Dyer and R. Boppana (2001), “A Comparision of TCP Performance over Three Routing Protocols for Mobile Ad Hoc Networks,” Proc. ACM MobiHoc, pp. 256-266. W.Y. Lee and I.F. Akyildiz (2008), “Optimal Spectrum Sensing Framework for Cognitive Radio Networks,” IEEE Trans. Wireless Comm., vol. 7, no. 10, pp. 3845-3857. Xin.C,.Song.M, Ma.L, and C.-C. Shen, “Performance analysis of a control-free dynamic spectrum access scheme,” IEEE Trans. WirelessCommun., vol. 10, pp.4316–4323, 2011.